In 2015 I made a prediction. I said that the Phillies were two years away from making the playoffs. I thought that in 2016, they’d be around .500 and in 2017, they would make the playoffs. Maybe something would go wrong, but by 2018, they would for sure be in the playoffs…. And I was totally wrong. However, predicting that the Phillies were just a few years away was not so crazy in 2015. There was a decent rationale behind it. The 2012 season saw the end of a golden age in Philly baseball. They ended their run of five straight division titles, including two trips to the World Series. What happened to the team is something that happens to every dynasty. They core of the team got old. Ruiz (33), Howard (32), Utley (33), and Rollins (33) had all declined. Nevertheless, all four stayed on through the 2014 season as everyday players. Their offensive output noticeably declined over the next two years. After 2009, the combined OPS+ of the four key Phillies gradually declined. By 2015, the Phillies turned a corner. It was clear that they were not going to win with the veterans. The next generation began to take the reins. The new middle infielders were Cesar Hernandez (25) and Freddy Galvis (25). Rookie Odubel Herrera (23) was the everyday center fielder. Cody Asche (25) was playing both leftf and third. When Asche wasn’t playing third, that job went to the Maikel Franco (22). With Cameron Rupp (26) behind the plate and Aaron Altherr (24) in the outfield, the horizon exhibited rays of hope. On the mound, the 2015 Phillies had some strong young pitchers. Adam Morgan, Jerad Eickhoff and Aaron Nola each made their debuts and showed they could hold their own in the big leagues. Ken Giles looked like he could be the closer of the future, with Hector Neris as his setup man. The minor league system was also looking good. Their top two picks from 2013, JP Crawford and Andrew Knapp, were progressing nicely. Their fifth round pick from 2014, Rhys Hoskins, was crushing the ball. In the second round of 2015, Philly took Scott Kingery. With a solid farm system and a lot of talented young everyday players, the city of brotherly love looked to be on the verge. The 2015 club lost 99 games, but many pieces were in place. All those good feeling went away in 2016. While they improved by eight games, the offense was feeble. They scored the fewest runs in baseball and were last in OPS. Hernandez, Galvis, Franco and Herrera all played at least 152 games but didn’t seem that great. The lack of depth was noticeable. The pitchers were hit hard and by June the team was coming apart by the seams. Is the young core good enough to win pennants? The 2017 campaign saw more of the same. Galvis, Franco and Herrera regressed while Hernandez and Rupp stayed put. Altherr showed improvements but struggled to stay healthy. Besides for Nola the pitching was well below average. By June the Phillies were the worst team in baseball. When all was said and done, the Phillies lost 96 games and were back in the cellar. After 2017, the Phillies felt that just rebuilding from within was not the way. Management concluded that a splash in the free agent market would put them over the top. Philly went out and signed Jake Arrieta and Carlos Santana to three years deals worth $75 million and $60 million respectively. Considering that each had turned down a qualifying offer, it was quite a statement. They inked Tommy Hunter and Pat Neshek to two-year deals to solidify the bullpen. With all the added stars and a new manager, it was hard not to feel that this was the year. Aaron Nola was one of the best pitchers in 2018. The season got off to a rough start. The Phils were 1-4 and fans felt that manager Gabe Kapler was making bad decisions. They then went 8-1 and optimism was back. The Phillies continued to play well and by July 26, they were 58-44 and had the second best record in the NL. Aaron Nola was pitching like a Cy Young award winner. The offense was clicking, and it appeared that they’d end the playoff drought. By the July trade deadline, the Phillies were clearly buyers. The acquired Asdrubal Cabrera from the Mets and Wilson Ramos from Tampa. In August they traded for Justin Bour and Jose Bautista for added depth. But then, disaster stuck. The good feeling ended with the gut wrenching game of August 6th. With a 2-0 led in the ninth, rookie closer Seranthony Dominguez coughed up the lead. A David Peralta blast in the 14th ended the game and Arizona stole more than a win. Good teams recover from bad losses. The Phillies went into free fall mode. From that point on, they went 17-34 and ended the season at 80-82. To make matters worse, the team had a Pythagorean winning percentage that indicated that they should have been ten games below the .500 mark. In other words, they were lucky to even be that good. It is hard to pinpoint the exact reason for the collapse, but they just looked like a team that lost its way. The infield of Howard, Utley and Rollins is now a distant memory. To conclude, there is a lot to say about the Phillies. For starters, rebuilds do not always work. In the four seasons since the Ruiz-Howard-Utley-Rollins era ended, the Phillies are yet to have a winning season. At this point many people think that their young core is overrated. In addition, they made several moves at the deadline to improve, but the team only got worse. While this isn’t the most epic collapse ever, it is bad. It hurts Phillies fans since a promising year ended with a bad record. To make matters worse, the division was weak. The Mets and Nats underachieved while the Marlins were dreadful. By the end, it didn’t even seem that Atlanta was so great. Rather no one could challenge them. 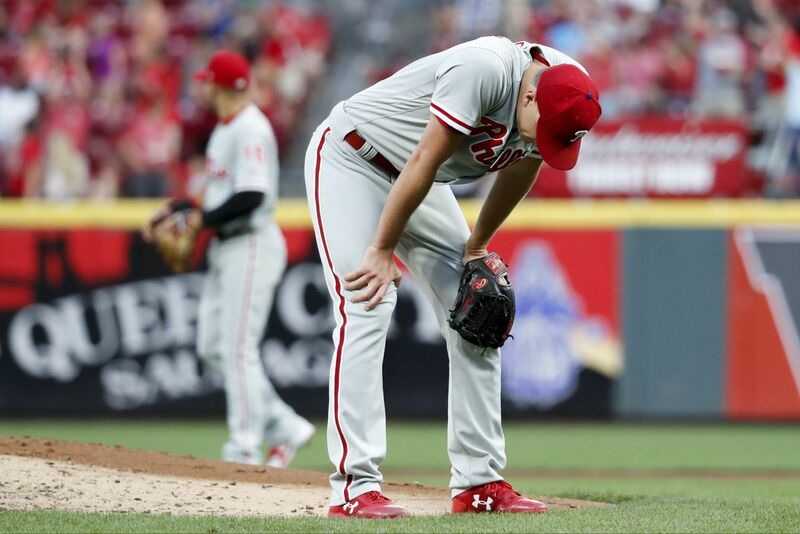 Moving forward, the Phillies are in semi-purgatory. The don’t want to blow up the team and rebuild but their current pieces aren’t leading to success. That is why predicting how good this team will be in 2019 will not be easy unless they make huge changes.